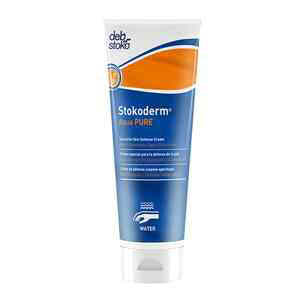 Catalog: Stokoderm® Aqua Pure Cream 100 mL tube. 12/Case. Stokoderm® Aqua Pure Cream 100 mL tube. 12/Case. Silicone-free, this cream is specially formulated for skin exposed to water-based substances, such as water-mixed oils and cooling agents, dyestuff solutions, acids, alkalis, and salts. It's ideal as a pre-work cream when working with cement, lime, and fertilizers too. 100 mL tube. 12/Case.